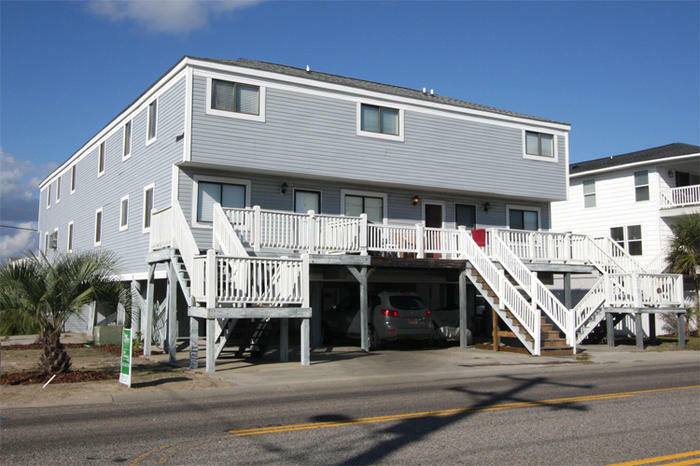 Enjoy private accommodations at a small North Myrtle Beach condominium complex that is located right at 51st Avenue North and Ocean Boulevard in the popular Cherry Grove section of North Myrtle Beach, South Carolina. Please note that these two-story North Myrtle Beach condominiums are up one flight of stairs. They are built atop a garage and there is not an elevator to the front doors of these North Myrtle Beach vacation rentals. Sit on the balcony at this North Myrtle Beach condo complex and reflect on your North Myrtle Beach vacation day. There is nothing like relaxing in the sunshine where you can hear the waves, smell the salty air and dream about all the fun your family will have on their North Myrtle Beach vacation at Beach N Fun. Beach N Fun can overflow with the sounds of seagulls and the lure of crashing waves. Elliott Beach Rentals is not affiliated with onsite management or the HOA of Beach N Fun.